"It takes only two hours to destroy your life." Helping his part-time employee close a sale of land in Costa Rica has sent Loren Pogue -- real estate agent, missionary, former serviceman, Mason, Shriner, Lions Club Member, American Legion, VFW, and past Director of a Children's Home -- to prison for 27 years. He was victim to a reverse sting operation. As it turned out, his employee was a paid recipient of $250,000 of government informant money. The informant pleaded with Loren to help him sell a plot of land on a Costa Rican mountainside to a group posing as "investors" -- in reality, undercover agents who were shopping for a place to put an airstrip. That Pogue had no drug history; that the airstrip was never built; and that, even if built, it would be useless because of its location; none of this played any part in the court's decision. Pogue never saw nor spoke with the undercover agents prior to the one meeting he had with them. 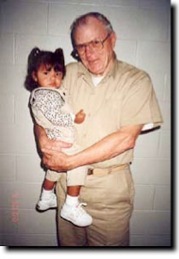 Five of Loren's children live over 3,000 miles from the prison in which he is held. He hasn't seen four of his children, or his wife in over 11 years. "There were no drugs involved. The government agents said they were going to fly 1000 kilos of drugs into the U.S., and that is what I was sentenced on." Loren is also featured in the Book Shattered Lives: Portraits From America's Drug War, from Human Rights 95, and in the series WIN AT ALL COSTS, from the Pittsburgh Post-Gazette. "My youngest biological child visited with me for a week. It was the first time that I was able to hold her, and tell her in person how much I loved her when I was changing her diapers and filling her baby bottles." Loren has 27 children in all, 15 are adopted. He went "from a happy, joyful life in a two hour meeting to pain, hurt and suffering." 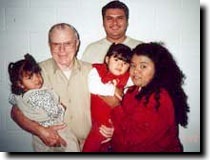 He is pictured below with his daughter, Tanya, his son, Joshua and grandchildren, Alan and Maina Noel.